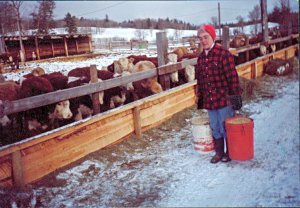 Connie Philip, farm wife at work. There’s a story about a couple getting married in a little Prairie town. As they paced down the aisle to sign the register whispers followed them. "Can you believe they got married before crop insurance day? No wonder half the community’s not here!" The first lesson a farm wife learns is that all personal matters have to fit around the farm schedule. No matter how important the occasion, it must take place, wives assure me, after seeding and before haying, between binding and thrashing. Technology might change but the agricultural rhythms don’t vary. The type of farm doesn’t much matter. Both Christine Hawkins and Connie Philip farm with their husbands in southern B.C. Christine, born and raised on a farm, vowed never to marry a farmer. Her husband Robert wasn’t a farmer when they got engaged. Then he decided to buy a dairy farm… Since they married they’ve had the dairy farm in Alberta, a vegetable farm and a feed lot. They’re now on a cattle ranch. How would she compare the different farms? "Vegetable farming is extremely seasonal and too reliant on weather. Dairy farming goes 365 days a year. On Xmas Day you still have to tend to the milking." Christine and Robert decided to give up their dairy farm after hearing the comments of a city housewife on a radio phone-in show. The price of milk had gone up a few cents. "I don’t know why we don’t get rid of all dairy farmers," sputtered the indignant caller, "I can get all the milk I need at the IGA!" Today on the cattle ranch ,in addition to housework, Christine helps with a variety of chores; chasing cows at midnight if the fence is down, assisting with cutting and baling, getting up at 4:00 am to turn the hay before the sun’s too hot. Then, there’s calving season…. It’s her duty to keep an eye on the cows about to calve, do a midnight check, wait an hour, do another check, wait another hour, and finally go to bed. Her day’s plans revolve around the expectant cows. It may be grocery day but if a cow’s calving, that cow takes precedence: after all those cows are the ranch’s livelihood. Christine swears that any time she and Robert are excited about going out to an event, some mean cow will deliberately create a problem. At the height of B.C.’s fires last summer the ranch people had special permits to pass through the fire checkpoints. Christine notes wryly, "You can’t just abandon 800 animals, irrigation lines and the hay for next winter." The fire burned as near as one hayfield away from them. Fire, like grasshoppers and drought, was just one more natural event for farm wives to cope with. Connie Philip, unlike Christine, dreamed of marrying a rancher. Born in Brandon, MB, she grew up and took her teacher’s training in Vancouver. She met Warner Philip, the rancher of her dreams, when she went to the Long Lake school as a hasty replacement for a male teacher who’d decamped in the middle of the year leaving a note that the rural children were "too stupid to teach." Connie notes that many of those same children went on to university. She and Warner, a third generation rancher, were married in 1950. The wedding took place after binding grain but before threshing. Even childbirth had to fit into the farm routine. One fall the threshing crew stopped Nov. 1st and Connie’s baby was born Nov. 5th. Trips could only be taken after seeding and branding and before haying. For many years holidays meant the family following Warner on the beef judging circuit from Saanich to Smithers, Williams Lake, Princeton and the Peace River country. They certainly saw B.C. but travel was still farm-related. In the early days of their marriage Connie stuck mostly to inside work, and there was plenty of it. "It’s a good thing Warner’s mother stayed on to teach me" she laughs. Cooking for regular ranch hands plus a threshing crew of 10-14 isn’t learned from a Betty Crocker cook book. Breakfast of porridge, bacon, eggs, potatoes, coffee and tea, was on the table by 5:30. As soon as it was cleared away the cooks began on lunch. Connie hadn’t a lot of experience cooking but she did her best and the workers were patient. She came to grief once with some red currant jelly. She knew it had set beyond her hopes when a normally quiet fellow, after trying unsuccessfully to spread it on his bread, spoke up. "Connie," he declared, "I think Goodyear would be interested in this!" Other rural peculiarities were the magneto telephones. One scorching summer day phone service went out on every ranch from Kamloops to Merritt. A lineman was instructed to find out why. Away he went. At each ranch house the hapless fellow followed the same routine; climb the pole, check the wires, down the pole, into the house, look at the connections, on to the next place. The Willow Ranch, Stump Lake and others passed in a haze of heat. The last ranch he came to was Philips’. "So, that’s the problem!" he exclaimed, staring at the telephone handle where Connie had innocently hung the phone book, thereby breaking all the connections along the line. The true test of a farm wife is her ability to adapt. Connie coped splendidly in 1951 when their house burned down. They had to live in the garage with orange crates for cupboards. The only things rescued from the fire were the washing machine and Warner’s guns. The washing machine, Connie points out, happened to stand right under the gun rack. Life went on. Her mother came to visit unaware that the family would be spending so much quality time in close proximity. Hunters who’d always hunted on the ranch turned up, slept on the garage floor, and gave the Philips feathers from the geese they shot; a little something towards new family pillows. Both Christine and Connie agree that ranching is hard work; couples who do it have to be prepared for change and ready to help one another. Whether it’s discussing shifting production from grain to cattle, or deciding who drives and who tosses hay bales from the truck, ranch couples are definitely a team. And farm wives experience rather unique proofs of their husband’s affections. For example, during the 2003 summer of fire, Christine drew the night shift watching haystacks and flumes to make sure they didn’t burn. She was on the job, some distance from her vehicle when she realized a bear was grazing between her and her truck. "He looked as big as a grizzly!" she recalls. She was all alone on the range. There was only one thing to do. Waving her arms and yelling she ran at the bear. "Woof", exclaimed the startled animal as it galloped away. She clambered into the truck and radioed Robert. His tender words to his wife marooned in a truck in a dark hayfield with a bear? "Stay in the truck!" Connie, too, has evidence of the considerate nature of a rancher husband. She and Warner were carrying calves with scours to the barn for treatment. Connie got to carry the calves’ hind ends because, Warner explained, "That’s the lightest part." Does it get discouraging? "Sometimes in the fall, "Christine admits, "after the twelve hour days, you just want to quit. Especially in 2003 with fires burning up the range and BSE scaring off exports. Remember, for years farm wives weren’t permitted to contribute to Canada Pension? Once, after we were allowed in, government sent me a notice of the amount I could expect to collect under CPP. It came to $l.75, enough for a cup of coffee. Then coffee went up… "
Is there a good side? "Sure, when people drop in, you can visit with them. You don’t have to ask for half a day off to see the doctor. You can do the chores early and go to church on Sunday." Would they do it all again? Of course. Christine " When I’m out in the fields at 4:00 am, watching the sun coming up, hearing birds start to sing, seeing little foxes and bears going about their lives; that’s my time with God." Connie: "When the children were young we were coming back from visiting a neighbour. We were tucked up snug in the sleigh, Warner driving the horses through the gathering darkness. We were all together and I thought how completely happy I was. "